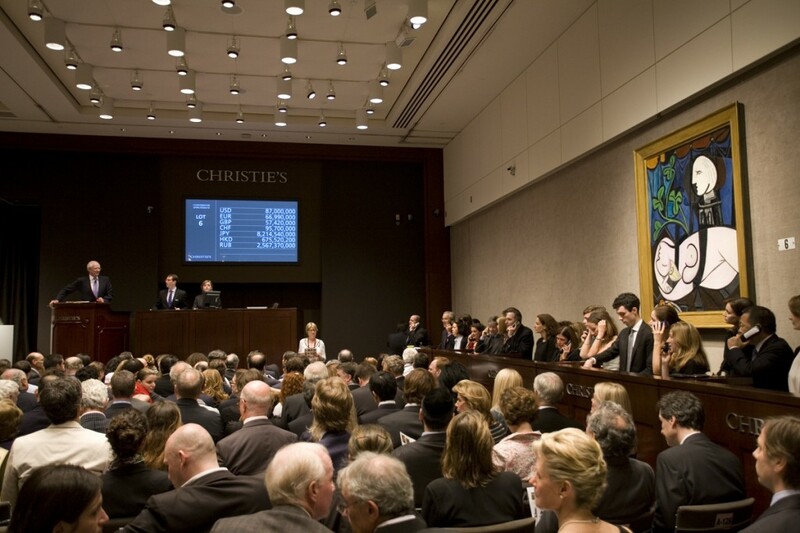 The number of column inches that the price-fixing fiasco between Sotheby’s and Christie’s has received recently has been nothing short of startling. But the subsequent resignations, the US Justice Department antitrust investigations and the outcry from clients and shareholders have to a great extent overshadowed the power and influence that these two monoliths of the art world really command. Amazingly they control 95 per cent of the worldwide art salesroom business and have done so for many years. A quick glance at the problems that Bill Gates is currently experiencing only goes to show how influential they have been in keeping their monopoly on art sales to themselves for the past two and a half centuries. Sotheby’s, for instance, bigger of the two by just a whisker, was a company that started as a bookseller in 1744. Its first sale, the contents of a gentleman’s library, barely realised a couple of hundred pounds, yet last year they recorded a turnover of just under 2 billion dollars. The company was bought in 1983 by American entrepreneur Alfred Taubman, a shopping centre billionaire who swiftly used his considerable talents to turn a venerable old institution into a powerful stock market performer with over 100 offices around the world. The board now boasts such influential surnames as Rockefeller, Getty and von Thyssen to name but a few. When the downturn came in the late 1980s, the market slowed considerably, especially with contemporary art which bottomed out completely. The need for cashflow, as in every business, was pressing. Drastic measures had to be taken and as everyone now knows, this was the genesis of the cosy cartel and tinkering with commissions which is just the latest in a series of high-profile gaffes. But Sotheby’s had been involved in controversy before. Take the sale of thf McAlmont estate in Mount Juliet, Co Kilkenny, in 1986. The estate had just been sold to a consortium of businessmen headed by Tim Mahony of Toyota Ireland to be developed as a golf and country club. 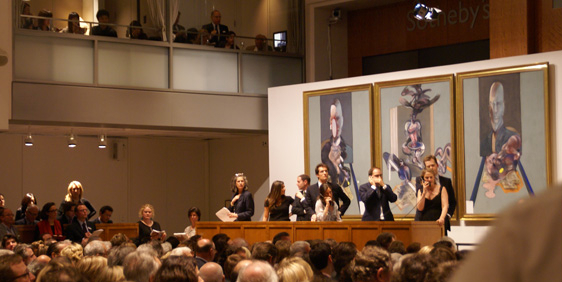 The sale of the contents of the house – a unique collection that had been in the McAlmont family for a few generations – was handled by Sotheby’s and was a high-profile affair that attracted attention from private buyers and dealers from across the globe. A heavily illustrated catalogue was issued and the sale went very well. Except for one hiccup; one of the paintings which had an estimate in the low hundreds sold for £27,000. To most people that would be a godsend but the art world does not like surprises of this nature. Sotheby’s thought the painting so insignificant that there wasn’t even an illustration of it in the catalogue. It was subsequently learned that the painting had been bought by London art dealer David Posnett, who had identified the work as a sketch of Captain Cooke by William Hodges. Hodges was the official artist on Cooke’s voyages to the south seas. Posnett later sold the painting to the National Maritime Museum in Greenwich for stg£650,000. With the resources available to the big two, one wonders how something on this scale could happen. One half of one of their big departments, of which the have numerous experts in every conceivable area of collecting, would still be bigger than our biggest Irish auction house, yet things like this rarely if ever happen here. 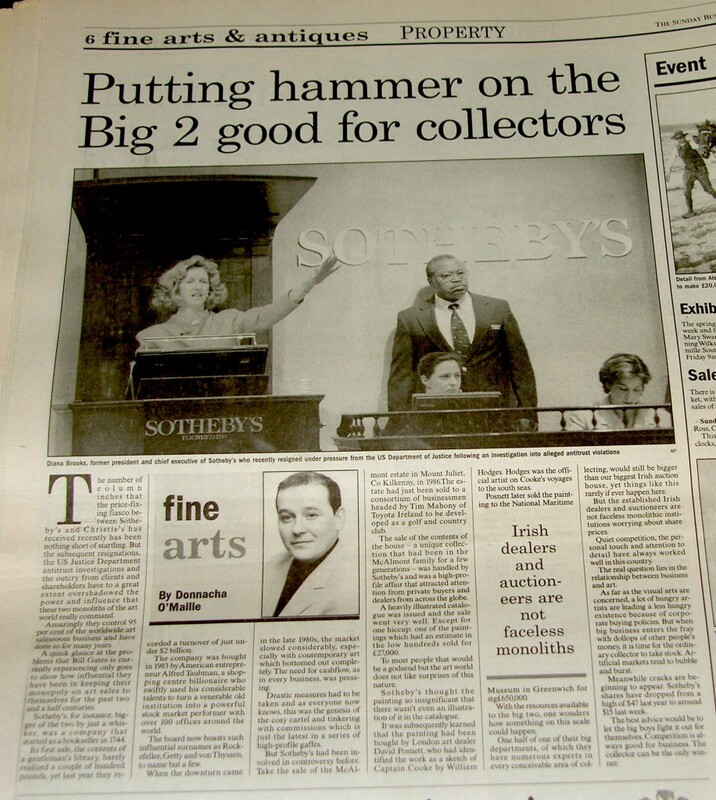 But the established Irish dealers and auctioneers are not faceless monolithic institutions worrying about share prices. Quiet competition, the personal touch and attention to detail have always worked well in this country. The real question lies in the relationship between business and art. As far as the visual arts are concerned, a lot of hungry artists are leading a less hungry existence because of corporate buying policies. But when big business enters the fray with dollops of other people’s money, it is time for the ordinary collector to take stock. Artificial markets tend to bubble and burst. Meanwhile cracks are beginning to appear. Sotheby’s shares have dropped from a high of $47 last year to around $15 last week. The best advice would be to let the big boys fight it out for themselves. Competition is always good for business. The collector can be the only winner. 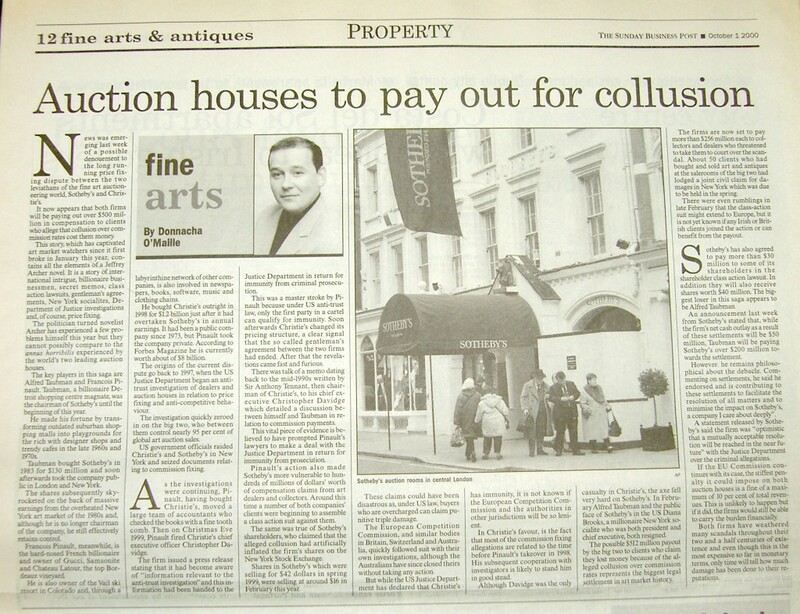 This article was first published April 2, 2000 in the Sunday Business Post. The online auction marketplace has changed considerably in 10 years. They said it couldn’t last. For months the analysts have been painting the walls with a dark thick impasto. The message was there for all to see – internet stocks were simply selling way above their value. As long as share prices kept on rising no one was willing to ask the important questions – where are the profits, where is the revenue. But in spite of recent setbacks, I wouldn’t necessarily write the internet out of the equation just yet. The “even-ning out”, as it was euphemistically called last week, of the new versus the old economy shares has justifiably put the whole issue of the function, usefulness and philosophy of the internet into focus. As far as the antiques trade is concerned it is either a godsend or a major thorn in the side, depending on your perspective and level of technology awareness. The growth of online auctions on the web has the potential to change the entire nature of the business and for both buyer and seller it should be looked at with equal parts enthusiasm, apprehension and prudence. There are still a lot of issues that have to be addressed, most notably security, payment methods and insurance. But all these issues are currently being sorted out and should be seen not as obstacles to entry, but rather as opportunities to develop greater confidence for both vendor and buyer in the potential of trading over the net. You could say that it was really Amazon that started the whole e-commerce ball rolling. It was Amazon, at any rate that first caught the public imagination. It started out as a small retailer of books over the internet, and then metamorphosed into a super retailer of anything to anyone, anywhere. Then came the “clicks and mortar” revolution as major American companies decided that they should be having a slice of this rather large cake. One after another they set up e-tailing departments and began plying their wares over the internet. With expectations for Christmas sales over the internet now set to exceed conventional channels within a couple of years the rest of the word has woken up. 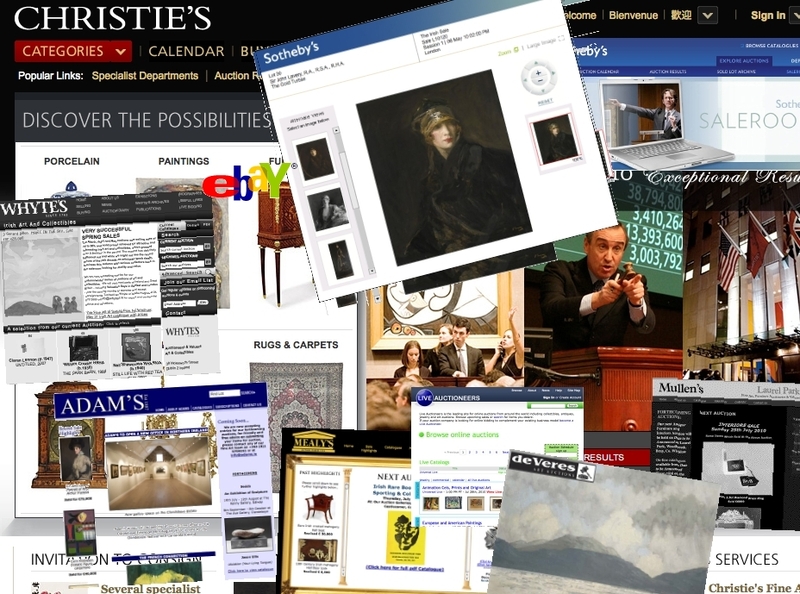 Enter the online auction house. As usual the US has set the example and the rest of the world has not been too slow to catch up this time. The first site to receive any significant attention was Ebay (www.ebay.com) and it is still very much the benchmark against which all others have set their standards. Ebay likes to refer to itself as an online trading community, which is a reversion to older trading methods where the middleman was cut out of the trading flow and individuals sold directly to each other. This philosophy of community is further enhanced by Ebay’s bulletin boards where like-minded individuals can discuss mutual areas of interest. Sellers are encouraged to set up their own home page with facilities on the site providing for lists and pictures of items, biographies of the sellers and recommendations from previous purchasers. Their ultimate aim is to bring online trading into the realm of lifestyle choice but in reality the overall thrust of the site lends itself more towards the car boot sale analogy than the auction house one. But having said that Ebay’s success has been phenomenal and its imitators large in number. An Irish version Ebid (www.ebid.ie) was launched in January and, as should be expected, it has a significantly Irish flavour. But it has a long way to go to being anywhere near as successful as Ebay. The Ebay site literally had millions of items for sale when I looked at it last week as opposed to the couple of hundred on the Ebid site. But it is early days yet. As far as costs go commissions on sales are calculated on a sliding scale of between 0.5 per cent to 5 per cent by Ebid; these are based on the value of the item being sold. 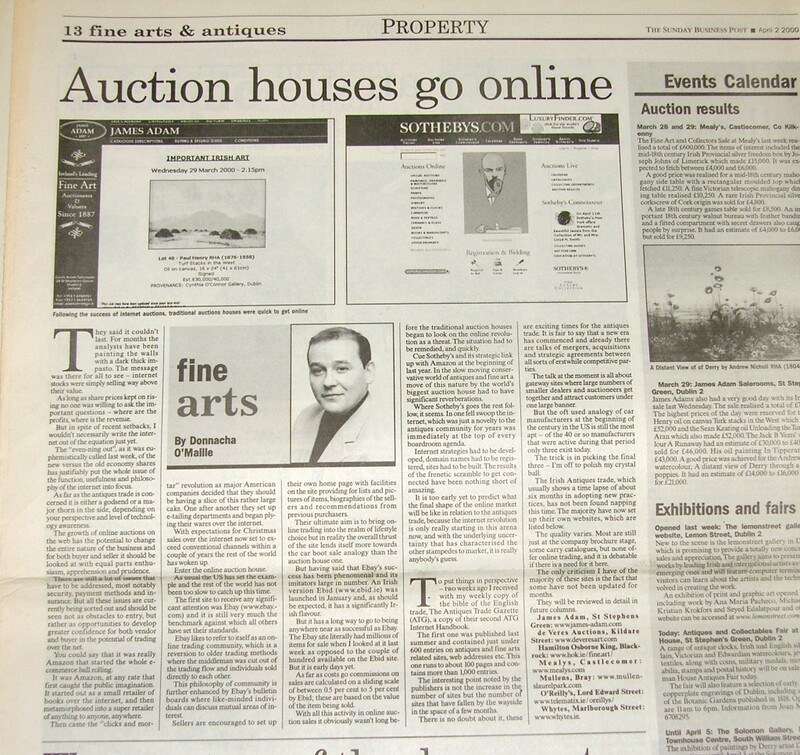 With all this activity in online auction sales it obviously wasn’t long before the traditional auctions houses began to look on the online revolution as a threat. The situation had to be remedied, and quickly. Cue Sotheby’s and its strategic link up with Amazon at the beginning of last year. In the slow moving conservative world of antiques and fine art a move of this nature by the world’s biggest auction house had to have significant reverberations. Where Sotheby’s goes the rest follow, it seems. In one fell swoop the internet, which was just a novelty to the antiques community for years was immediately at the top of every boardroom agenda. Internet strategies had to be developed, domain names had to be registered, sites had to be built. The results of the frenetic scramble to get connected have been nothing short of amazing. It is too early yet to predict what the final shape of the online market will be like in relation to the antiques trade, because the internet revolution is only really starting in this arena now, and with the underlying uncertainty that has characterised the other stampedes to market, it is really anbody’s guess. To put things in perspective – two weeks ago I received with my weekly copy of the bible of the English trade, The Antiques Trade Gazette (ATG), a copy of their second ATG Internet Handbook. The first one was published last summer and contained just under 600 entries on antiques and fine arts related sites, web addresses etc. This one runs to about 100 pages and contains more than 1,000 entries. The interesting point noted by the publishers is not the increase in the number of sites but the number of sites that have fallen by the wayside in the space of a few months. There is no doubt about it, these are exciting times for the antiques trade. It is fair to say that a new era has commenced and already there are talks of mergers, acquisitions and strategic agreements between all sorts of erstwhile competitive parties. The talk at the moment is all about gateway sites where large numbers of smaller dealers and auctioneers get together and attract customers under one large banner. But the oft used analogy of car manufacturers at the beginning of the century in the US is still the most apt – of the 40 or so manufacturers that were active during that period only three exist today. The trick is in picking the final three – I’m off to polish my crystal ball. The Irish Antiques trade, which usually shows a time lapse of about six months in adopting new practices, has not been found napping this time. The majority have now set up their own websites, which are listed below. The quality varies. Most are still just at the company brochure stage, some carry catalogues, but none offer online trading, and it is debatable if there is a need for it here. The only criticism I have of the majority of these sites is the fact that some have not been updated for months. They will be reviewed in detail in future columns.